It was the middle of the night in late October 1986 and I was listening to the radio as I lay in my bed, in a dark, damp, dingy bed-sit in Dublin. I was feeling despondent - yes despondent - when Gary Carter delivered a serious shot of hope for the New York Mets and, thus, for me. Fans of the Mets and the Boston Red Sox who are old enough remember clearly how that 10th inning of the 6th game of the 1986 World Series played out. As far as I'm concerned it was Carter and not Mookie Wilson nor Ray Knight, both of whom feature in the most famous clips from that game, who delivered the biggest blow for the Mets in that inning/game/series. It was Carter who spit in the eye of despair and sprinkled the Mets and their fans with hope. Hope. That's what was missing in that last inning of (what would have been) that last game. When Carter got his hit he changed the mood. I could feel it from 3,000 miles away. I could sense it despite the fact it was 5:00 in the morning and despite my pitch black surroundings and I had nothing but a radio for company. I could feel that tingle and it was thanks to Carter, who declared: "We're not done." I remember as I was listening to that inning unfold I kept thinking about Carter - how I'd actually never been fair to him; how I'd never really liked him. As my hopes mounted with the Mets' rally I kept asking myself what is it about me that I never warmed to Gary Carter? I had often considered what it was about Carter that bothered me, but in that moment when he'd demonstrated - again - that he was a winner I turned the question around so that it was me that I was wondering about. What was it about me that I couldn't take to Carter the way I did the other players on that team? I knew, but I didn't understand why. Carter's overt wholesomeness turned me off. Carter stood out on that Mets team because he seemed too good to be true. He was never in the papers for the wrong reason. He never seemed to have anything bad to say about anyone. He didn't seem to curse, even. He always played hard. He was always smiling. What's not to like, right? Yet I didn't. I was cynical and when I think back on it, what on Earth did I have to be cynical about? I was young and the world was my oyster, but for some reason I liked those players who were ... a bit edgy. Carter certainly was not edgy. Most of the Mets were Rock n Roll, but Carter was Christian folk music. Everything I knew about Carter (and everything I've read and heard about him since) told me that Carter was a model ballplayer and a model citizen. I should have idolized him, but I didn't. A few years ago I was listening to the Mets' radio announcers talking about their profession during a rain delay. The two announcers were talking about how players will confront the announcers when they make a critical comment. Then Howie Rose said that only once in his career had he heard from a player after making a positive remark. It was Gary Carter. He had heard something Rose had said and sought him out just to say "Thank you." When I heard that story all I could think was, "What was wrong with me when I was 21?" You'll often hear it said that athletes are not heroes. Well most of them are not, but by all accounts Gary Carter was. His performance on the baseball diamond was heroic. His attitude to life was heroic. His devotion to his family was heroic. His courage in the face of the brain cancer that took his life was heroic. 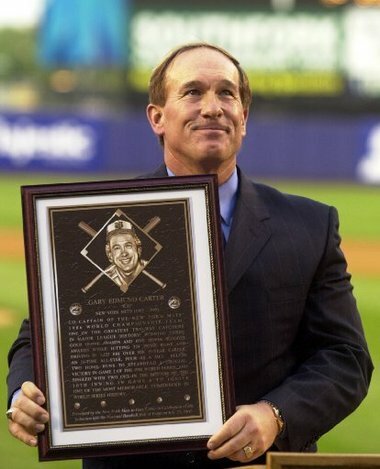 Of all the tributes to Carter that I've heard and read since he died last Thursday the most poingnant and most telling was from his often-troubled 1986 Mets' teammate, Darryl Strawberry who simply said, "I wish I could have lived my life like Gary Carter. He was a true man." "I wish I could have lived my life like Gary Carter." He didn't wish he had played like Carter, but lived like him. Carter's example is something that Strawberry now sees as a model to follow. That's heroic. Of course I didn't know Carter as Strawberry did, but in that one moment in 1986 he had an impact on me. He forced me to confront something in me that I thought needed correcting. Over time, as I grew up (okay, grew older) and I learned more about Carter the man I realized there was nothing to dislike in him. It was in me. He helped make me a better person. That's what heroes do.